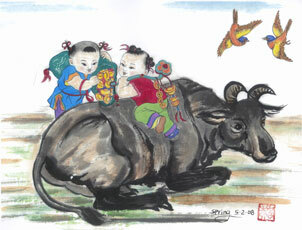 Home >> Articles >> 2009, The Year of the Ox - Happy Chinese New Year! 2009, The Year of the Ox - Happy Chinese New Year! The Chinese year 4707 begins on January 26, 2009. Chinese months are reckoned by the lunar calendar, with each month beginning on the darkest day. The Chinese year 4707 begins on January 26, 2009. 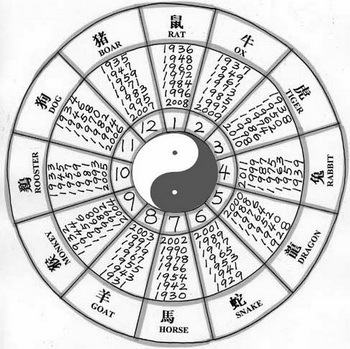 Chinese months are reckoned by the lunar calendar, with each month beginning on the darkest day. New Year festivities traditionally start on the first day of the month and continue until the fifteenth, when the moon is brightest. In China, people may take weeks of holiday from work to prepare for and celebrate the New Year. The Ox, or Buffalo sign, symbolizes prosperity through fortitude and hard work. Those born under the influence of the Ox are fortunate to be stable and persevering. The typical Ox is a tolerant person with strong character. Not many people could equal the resolution and fearlessness that the Ox exhibits when deciding to accomplish a task. Ox people work hard without complaints at work or at home. They know that they will succeed through hard work and sustained efforts, and do not believe in get-rich-quick schemes. One famous person born in the year of the Ox is Barack Obama. If you were born in 1913, 1925, 1937, 1949, 1961, 1973, 1985, and 1997 - you were born under the sign of the Ox. Invariably solid and dependable, Ox people are excellent organizers. Oxen are systematic in their approach to every task they undertake. They are not easily influenced by other's ideas. Loyalty is a part of their make-up, but if deceived they will not forget. Oxen do not appear to be imaginative though they are capable of good ideas. Although not demonstrative or the most exciting people romantically, they are entirely dependable, and make devoted parents. Oxen are renowned for their patience, but it has its limits - once roused, their temper is a sight to behold. People born under the sign of the Ox or Buffalo usually have strong codes and work ethics. This can lead to a tendency to be a workaholic, and they should make an effort to relax more. Ox people are usually strong and robust, and according to ancient wisdom, they should be blessed with long lives. The Ox home is his castle where he finds relaxation and peace from the everyday hustle and bustle of his career or responsibilities. He also enjoys spending much time in planting gardens and trees. He generally prefers to decorate his home comfortably with nature colors. Able, ethical and aware, co-workers of the Ox can depend on their eyes for details. Because they are so well-organized, they are better-suited for specialized positions and prefer to work in large companies. At Chinese New Year celebrations people wear red clothes, decorate with poems on red paper, and give gifts of "lucky money" in red envelopes. Red is associated with fire, which is thought to drive away bad luck. In China, the New Year is a time of family reunion. Family members gather at each other's homes for visits and shared meals, most significantly a feast on New Year's Eve. In the United States, many Chinese immigrants arrived without their families, and found a sense of community through neighborhood associations instead. Today, many Chinese-American neighborhoods host New Year's banquets and other events. In some areas of China it's a popular custom to give oranges because in Chinese, the word "orange" sounds like "Ji", which means "good luck". People present oranges to their friends and relatives to express their respects and good wishes for the coming year. Chinese New Year ends with the lantern festival on the fifteenth day of the month. Some of the lanterns may be works of art, painted with birds, animals, flowers, zodiac signs, and scenes from legend and history. People hang glowing lanterns in temples, and carry lanterns to an evening parade under the light of the full moon. In many areas the highlight of the lantern festival is the dragon dance. The dragon—which might stretch a hundred feet long—is typically made of silk, paper, and bamboo. Traditionally the dragon is held aloft by young men who dance as they guide the colorful beast through the streets. Famous Ox People: Barack Obama, Catherine Freeman, Jack Nicholson, Juliette Lewis, Margaret Thatcher, Meg Ryan, Meryl Streep, Princess Diana, Vivien Leigh and George Clooney.